GSCI stands for Goldman Sachs Commodities Index. S&P, of course, stands for Standard and Poor's. Goldman Sachs originally developed this series of commodity indices to cover the major commodity groups. These indices are weighted according to world production, which means the most prevalent commodities carry the most weight. The S&P GSCI indices cover energy, agriculture, precious metals, livestock and industrial metals. The “Total Return” version of these indices measures a fully collateralized futures investment that is rolled forward each month. The indices based on spot prices are not subject to collateral or rollover issues. 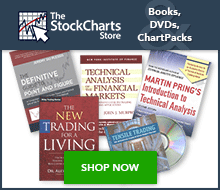 StockCharts.com users can access an up-to-date list of symbols for all our S&P GSCI Indices. From this list, click the “Mentions” icon to the right of a specific symbol for more details about the symbol, as well as recent mentions in Public ChartLists, blog articles, and more.